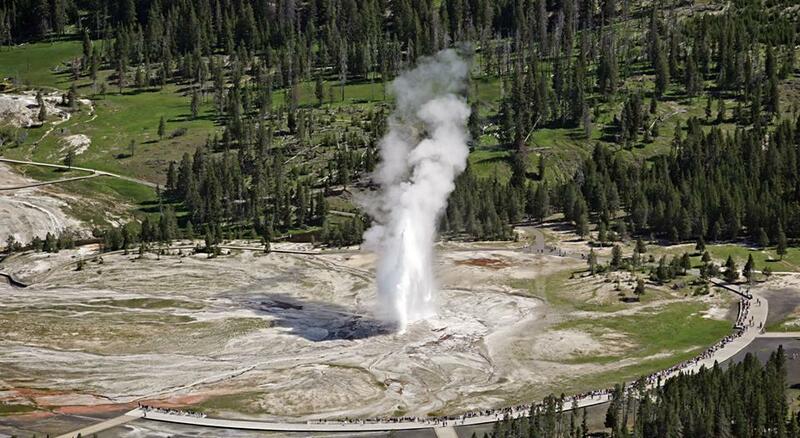 A cone geyser called Old Faithful located in Yellowstone National Park in Wyoming, United States. 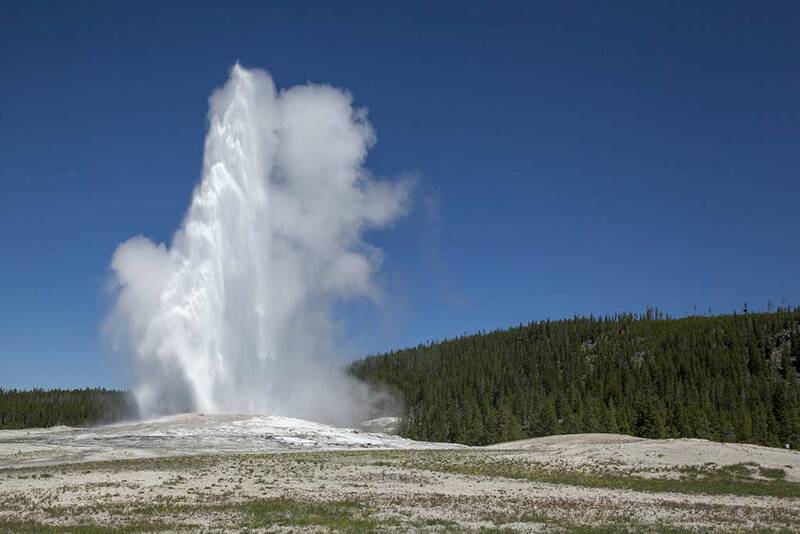 This was the first geyser to name in the park in 1870. 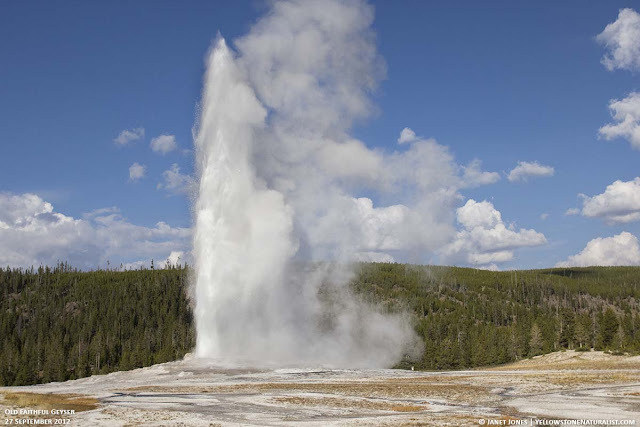 Old Faithful is a very predictable geothermal geyser, as it erupted every 44 to 125 minutes. The members of the Washburn-Langford-Doane expedition discover this Old Faithful geyser in 1870. It spouted at regular intervals. The boiling water being thrown from 90 to 125 feet at discharge lasted 15 to 20 minutes. So, they give the name to Old Faithful. Earlier it was used as a laundry place. 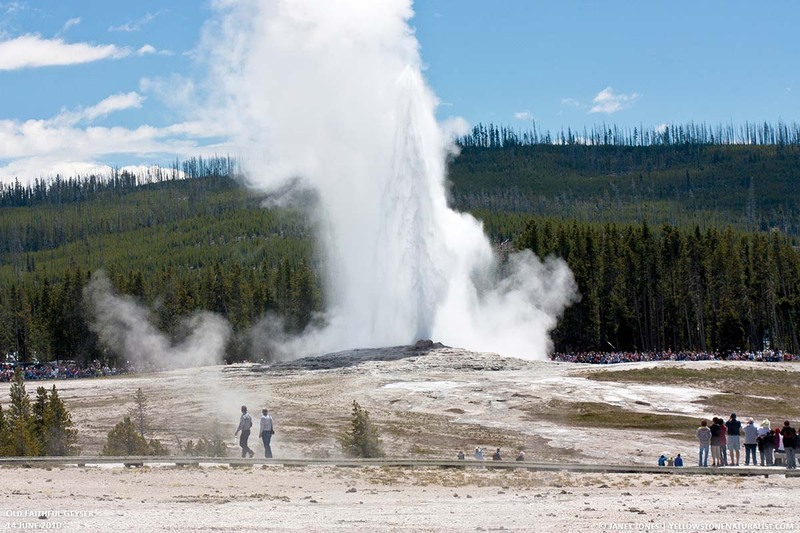 Garments placed thoroughly washed when it erupted. This geyser is the most popular of the nearly 500 geysers in Yellowstone National Park. Old Faithful normally erupting a column of steam and super hot water expanding steam bubbles push the water overhead through the fissures in the rock until they overflow from the geyser. Old Faithful is an example of a cone geyser visible on Earth’s surface as mounds of porous deposits of siliceous sinter. 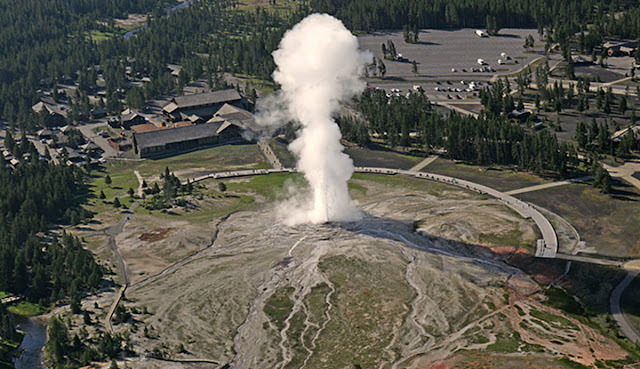 The historic Old Faithful Inn (1903/04) is one of the country’s great national park lodges; Old Faithful Lodge (1918/28) and other vintage buildings are also in the vicinity. So, far more than 1,000,000 eruptions have been recorded. 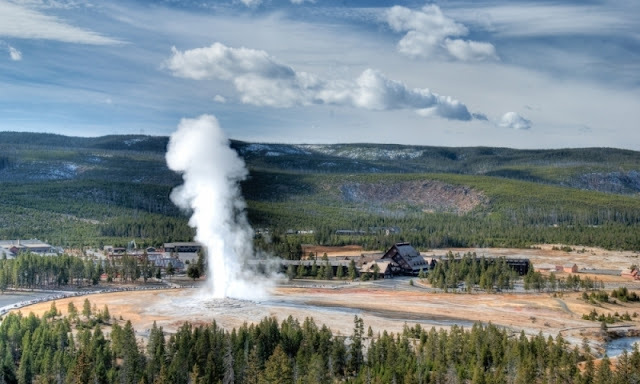 The nearby Steamboat is tallest and larger than Old Faithful geyser. The old Faithful reliability can be attributed to the fact that is not connected to any other thermal features of Upper Geyser Basin. The average height of an eruption is 145 to 150 feet with intervals between 60 to 120 minutes. In the 1930s, the eruption takes place 66 minutes but gradually increasing the time to 90 minutes. The result of increasing in time could be due to earthquakes affecting subterranean water levels. 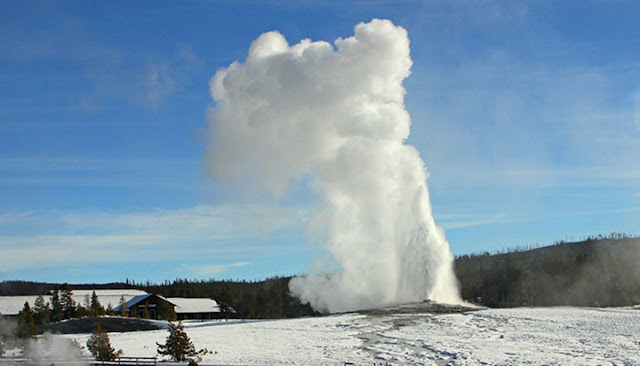 The Old Faithful mathematical eruption is much predictable in terms of its next eruption. The temperature measurement at depth is 118 °C is similar to measure in the 1940s. However, the steam temperature has been measured by more than 350°F. 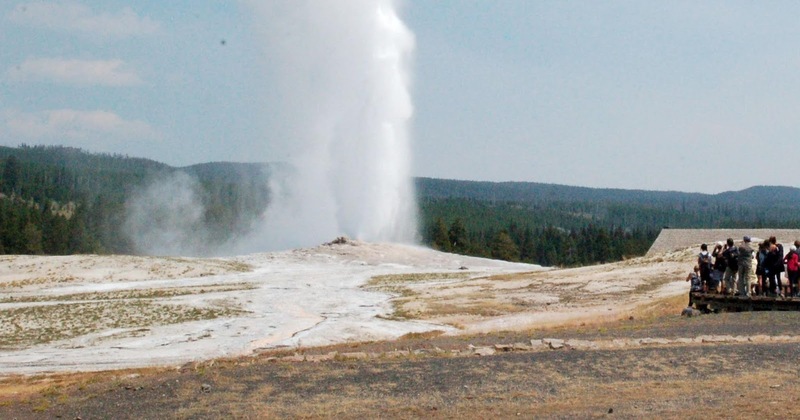 Scientists estimate 3,700 to 8,400 gallons of water expelled during an eruption. But it mainly depends on the duration of the eruption. 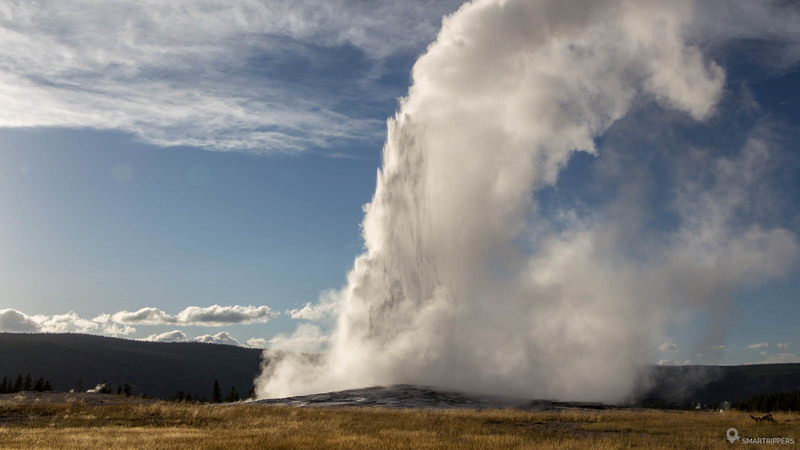 The Old Faithful inspired early developers to build special viewing areas, lodging, and concessions for visitors to watch eruptions. The natural geologic processes of Old Faith continue to provide enjoyment to visitors to see this natural system. The Visitor Education Center provides visitors to an opportunity to learn about the geology, hydrothermal properties, and scientific study of Old Faithful and other hydrothermal features in the park.